Away from the clamour of the Uffizi is one of Florence's true treasures, the Benozzo Gozzoli fresco in the chapel at the Palazzo Medici-Riccardi. Modern tourists entering this room are funnelled through a side entrance, which detracts from the original intended experience. 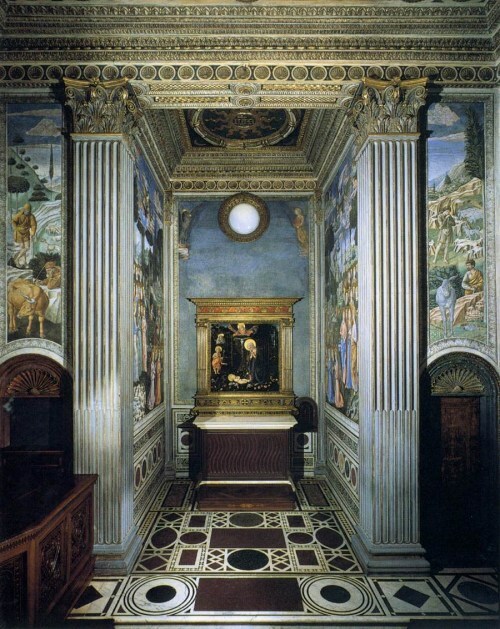 This chapel was a collaboration between leading artisans and the most powerful man in Florence at the time, Cosimo de' Medici (1389-1464), often called Il Vecchio(The Elder) to distinguish him from Cosimo I de' Medici (1519-1574), the later Grand Duke of Tuscany. Gozzoli's astounding Procession of The Magi flanks Lippi's Adoration. It is also an allegory of the Council of Florence in 1439. 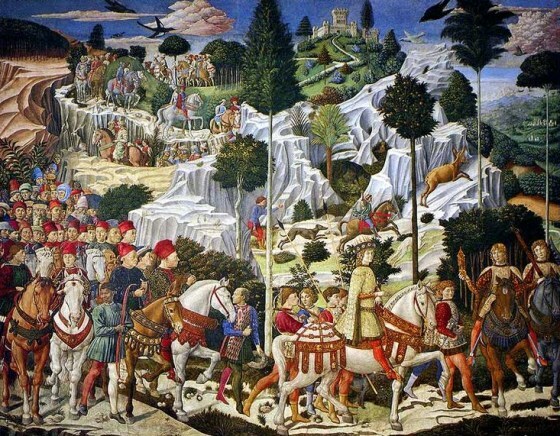 The Gozzoli fresco depicts the Procession of the Magi. This work itself is as much about the history of the Byzantine Empire in the mid 1400s than it is a depiction of a religious scene. The fresco itself surrounds the walls of the chapel. The short video below is a wonderful description of the chapel as it can be seen today, and the momentous occasion it depicts. However, the focal point of this amazing space was a masterpiece executed by the most accomplished Florentine painter of the day, Fra Filippo Lippi's Adoration of the Christ Child, completed between 1459-60. This painting is sometimes referred to as The Madonna in the Forest. This painting is seen as an illustration of the debate between Orthodox and Western Churches which took place at the Council of Florence in 1439, in which Cosimo de' Medici took part, hosting the travelling Byzantine Emperor John VIII Palaiologos. It was the jewel at the centre of the amazing private chapel - something that can not be fully appreciated with the rather lacklustre copy in its place today and the view tourists are forced to traverse the room in. Knowing the original was one of the most unique and accomplished works of the early Renaissance, and now resides many miles away in Berlin, tells a poignant tale about the ebb and flow of great fortunes and how art seems to be intrinsically linked to this. Of the cadre of Medici that haunted and dominated Florence for centuries, Cosimo is one of the more sympathetic characters. His legacy in commerce, politics and patronage of the arts is profound. He began the famous Medici acquisition of ancient texts from around Europe and the Middle East, many of these being monastic copies of texts on philosophical and scientific principles. An earlier post at 3PP focused on his acquisition of the Divine Pymander of Hermes Trimegistus - which also includes a great BBC podcast. Commenced in the 1520s, the Laurentian Library is decorated with references to the Grand Duke Cosimo I de' Medici, who ordered the library's construction to house the texts which Cosimo The Elder began collecting. Accompanying, and indeed driving this was the tremendous wealth generated by the Medici Bank. In Cosimo therefore, you had a pre-eminent example of a man caught between hedonism and philanthropy, as diverse projects he commissioned highlights. From monasteries to the Donatello's sensuous bronze David, Cosimo seemed to walk a tightrope of pleasure and dread at what awaited him in the next life. The church of Cosimo's day particularly frowned upon money lenders who made profit from charging interest - a practise known as usury. In Dante's Divine Comedy, a special place in Hell was reserved for usurers, which the devout Cosimo was all too aware of. This fear of eternal damnation seemed to be a great source of motivation for many of Cosimo's patronage projects to religious institutions. Of particular interest in Lippi's work is the theme itself - not a Biblical nativity, but actually a reference to the adoration described by St. Bridget of Sweden. 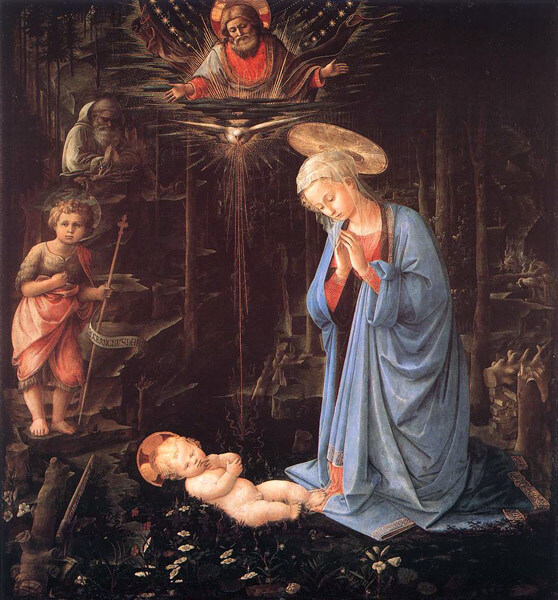 A foreboding wilderness was not typical to a nativity scene, and was hence a unique innovation by Lippi in this painting. 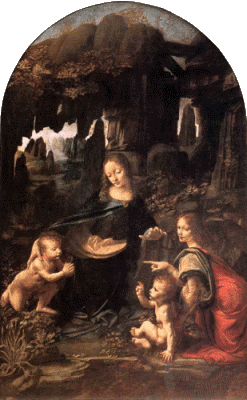 It was to prove influential to later artists, particularly Leonardo's famous Virgin of The Rocks, with echoes as far as Giorgione's Tempest in 1508. Lippi's visual and iconographical style seemed to resonate most strongly in his most famous apprentice, Sandro Botticelli. What I found most interesting - something not fully explored in the documentary - is that Lippi had a perpetual muse in the form of a beautiful young nun he had eloped with - Lucrezia Buti. Lippi's Seven Saints depicts himself in the guise of St. Peter of Verona, a 13th Century Domincian friar attacked in the head with a cleaver. The self portrait is a cheeky allusion to the headaches a vow of chastity and servitude were causing the passionate Lippi. This also seemed to be the case on a closer examination of Botticelli's work. Many identify this persistent face as that of famed Florentine beauty, Simonetta Vespucci - though there are some historians whom dislike the idea entirely. For more on the fascinating Simonetta, read this earlier article from 3PP: Simonetta Vespucci - the real-life muse of the Renaissance? Historians agree - novice nun, lover and mother to his children, Lucrezia Buti was Lippi's perpetual muse. 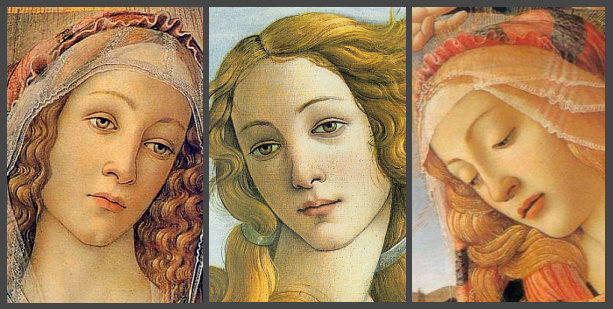 Lippi's student, Botticelli also had a perpetual muse - was it Simonetta Vespucci? The latter part of the documentary outlines the interesting saga of the painting's travels as part of collection of a Nazi hoarded artworks. They were eventually taken to the United States as part of a controversial reparations scheme, but were returned to Germany a few years later. The painting now resides at the Gemaldegalerie in Berlin. The program also features quite a lot of detail on the technical aspects of Lippi's execution of this work. The reconstructions done in the program were undertaken by the Hamilton Kerr Institute at Cambridge University, which you can read a fascinating article about here. This will be the last article for 2010... but back in early 2011 with more articles, interviews, guest posts and videos. You have some rather stunning works in the post, but the one I am most impressed with is Gozzoli's fresco depicting the Procession of the Magi. There may well have been religious and political themes in the fresco, but I like to think of it as the Medicis, Malatestas and Sforzas dressing up like royalty for a spot of parading with their retainers. STUNNING! I hope 2011 sees more great blogging. Another very fine post. The visual effects on the videos are stunning but I don't know why they persist in calling the Lippi a Nativity, even after one of the commentators said it's not. The baby Jesus is too old to be a new born, and all the traditional symbols of the Nativity are missing. The Lippi altarpiece is a depiction of the encounter of the Holy Family with the young John the Baptist on their return from Egypt. It usually occurs in a desert setting but the video explained why Lippi used a forest. The encounter with the Baptist is very important because it was often regarded as the first announcement of the sacrificial role of Christ. Notice the placement of the infant on the ground. He is right above the stone altar on which the Eucharist is placed. Thus the painting identifies the infant Jesus with the sacrificial offering on the altar--affirming his real presence. Finally, I think the old man in the background is St. Joseph. I don't know why he is called St. Bernard in the video. From the image I can't tell if the old man has a halo. I have a copy of this painting with the old man in the right foreground with a halo. @Hels - it is stunning indeed. it was easily the highlight of my trip - the interactive exhibit downstairs was also great fun, and very informative. @Frank - I think the reference to the nativity was that, in comparison to the Gozzoli's Procession of the Magi on either side, that you would expect a traditional nativity in the middle, but Lippi has re-purposed St Bridgit's vision to suit his patron. That whole room is about the Medici involvement in Council of Florence of 1439, that much can not be ignored. I highly recommend seeing The Procession of the Magi in person if you're ever in Florence. It is AMAZING! The restoration was fabulous. Also, I didn't know that Cosimo's symbol was a goat's head! I tried to look up more information on that, but I couldn't find anything. Do you remember where you read that? I noticed in the Cohen book that goats were sometimes seen as a symbol for sin (or the damned), but I'm sure that the goat must have had some other connotation or significance for Cosimo's family! Amazing and gorgeous post, Hasan! One of the highlights of 2010 for me was meeting you and this wonderful blog! May you continue to flourish in 2011. @Heidenkind - definitely a must see! The restoration made it look so fresh and vibrant. @M - well spotted M! Believe it or not - I overheard a staff member at the site explaining the goat motif to a fellow tourist - He said "that is Cosimo's symbol" .. but it seems I have made the mistake of mixing up my Cosimos! A tiny bit of further research will demonstrate that Cosimo I de' Medici, who commissioned the building of the Library adopted the goat as his symbol as his (second) rise to political prominence fell under the sign of Capricorn. 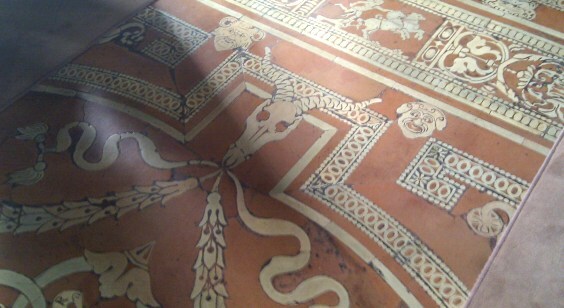 There is actually a great piece on it at the Palazzo Vecchio Website, and I have edited the post accordingly! @Vicky - thank you for the wonderful compliment! I hope I can continue to deliver more interesting content in 2011! My blog is intended to be for everyone, so I really appreciate your insights! What an interesting bit about Cosimo I de Medici! Thanks for including that information and link.